Optima Sensación Exclusivo de FJ, el Taction2™ Advanced Performance Leather®, de Pittards® Inglaterra brinda poderoso grip, excepcional resistencia a la humedad y la más delicada sensación, diseñado para durar suave más tiempo. Control de Humedad Tejido elastizado respirable PowerNet™ a lo largo de los dedos y nudillos crea comodidad fresca y mejora el ajuste y la flexibilidad. Calce Cómodo El Sistema patentado de cierre en 3 direcciones (3-DirectionalComforTab™) está colocado estratégicamente para un ajuste preciso y comodidad sin presión. ARE YOU WEARING THE RIGHT SIZE GLOVE? 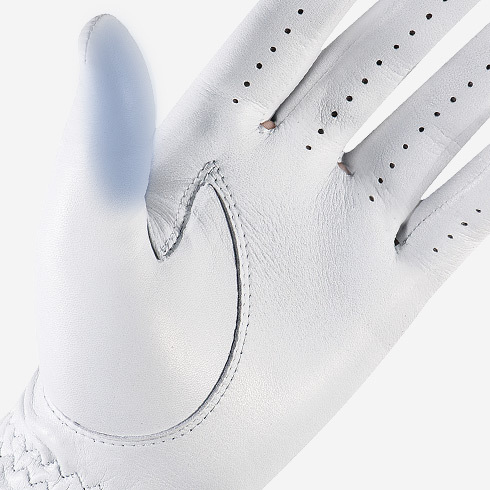 A proper fitting golf glove should fit like a second skin, tight across the palm and fingers, with no loose material. You should not have extra material at the top of your fingers, if you do, you may want to size down or try a Cadet glove in your size. The tab should only come about 75% of the way across the back of your hand (leaving 1/4” of Velcro® uncovered) to allow for adjustment during play. 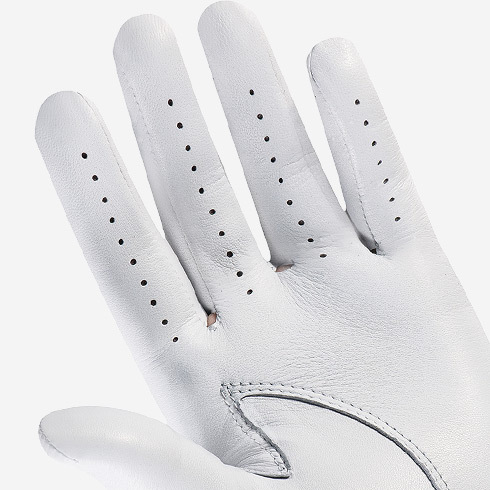 Upwards of 50% of golfers are estimated to be wearing the wrong glove size. Most are wearing a glove that is too big. 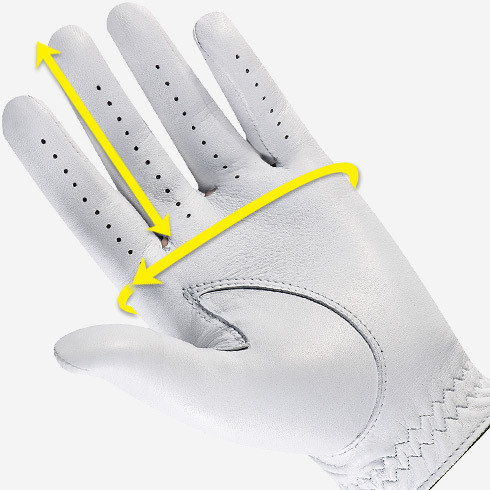 Your glove is the closest point of contact with your club; it should fit like a second skin. Any movement between hand and glove could compromise your swing. To measure your hand, download and print the following PDF on standard letter sized paper (8.5" x 11"). The first page is a guide to measure the length of your middle finger. The second page has a ruler you can cut out to measure the circumference of your hand. 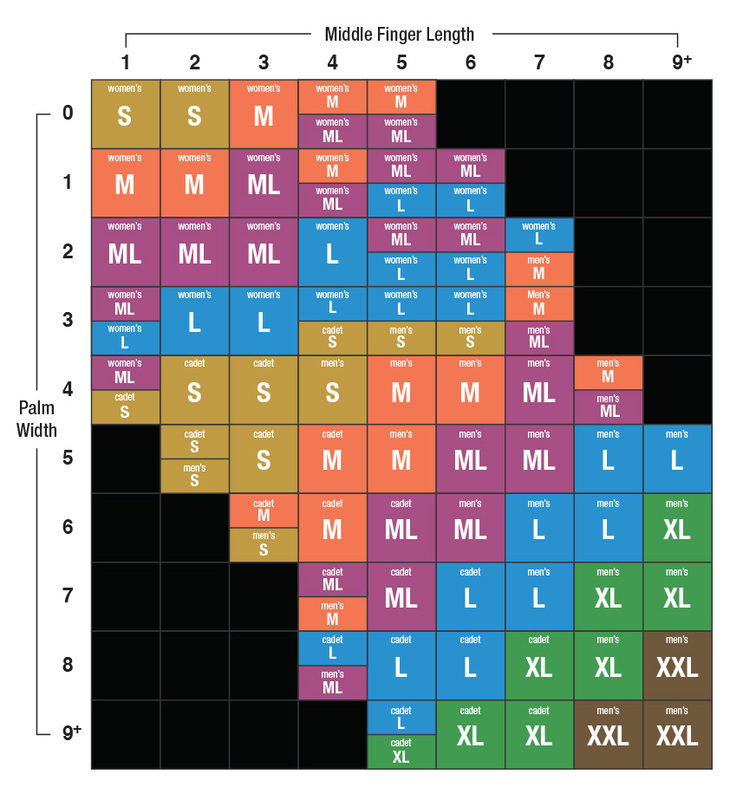 Use those two measurements to find your size in the following chart. If your size comes out different from what you normally wear, try the size we recommend first. 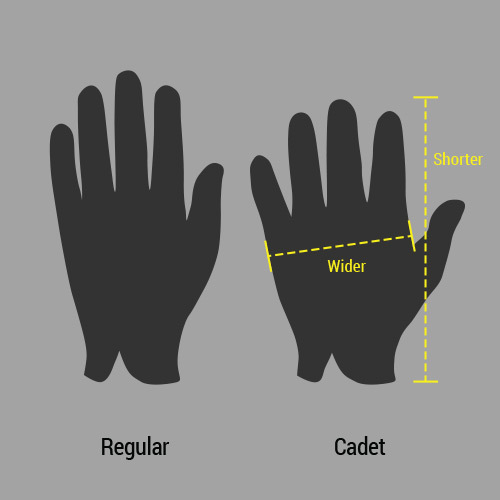 If your Finger Length number is LESS than your Palm Width number, try a Cadet glove in your size. If your Finger Length and Palm Width number differ by more than 2 than you will want to try on several sizes to determine the best compromise. For some men, a Womens glove may be your best option. 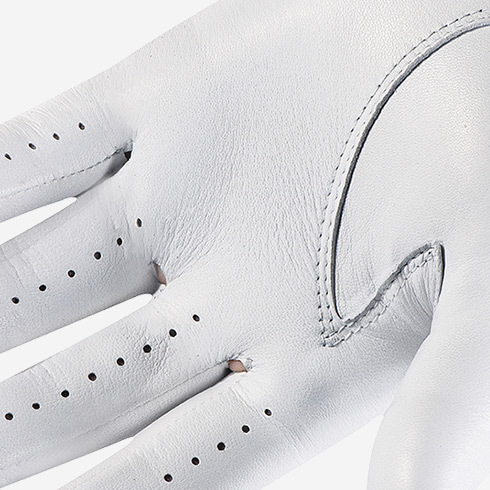 Several FootJoy tour players wear a Womens glove on tour for optimal performance. Be sure to read Are you wearing the right size glove? before making a final glove size determination. 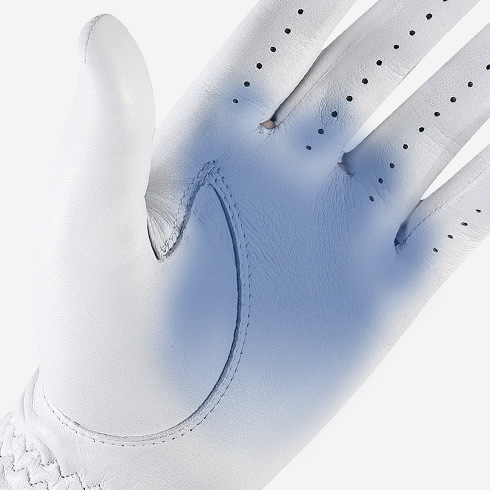 Ideally, your glove won’t show any wear before it is time to replace it, but if it does, then here are a few pointers that could improve your game. Your hands may be slipping during your swing, or you may be holding your club with your palms rather than your fingers. You may be re-gripping at the top of your swing, or you may be holding the club too close to the end. Check that you are gripping the clubs about an inch from the end. You may be extending your thumb too far down the shaft. Point your left thumb slightly toward the right for a more natural, comfortable backswing. Rotating between multiple gloves extends the life of each glove because it gives them more time to dry out. 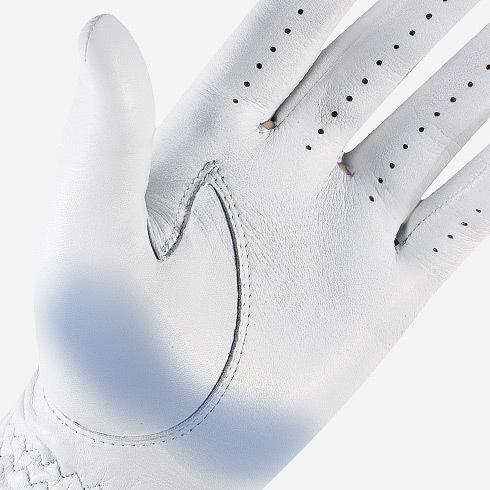 FootJoy golf gloves are offered in two different cuts to ensure a proper fit. Palm and fingers are standard proportions. Palm is wider and fingers are shorter. You have extra material at the tops of your fingers in a Regular glove but sizing down doesn’t leave ¼” of Velcro® exposed. You find that your fingers swell during a round.